I told ya I’d be making pizza again soon! Last week’s Tostada Pizza was so easy and delicious, I wanted to get creative on the pizza front again as soon as possible. 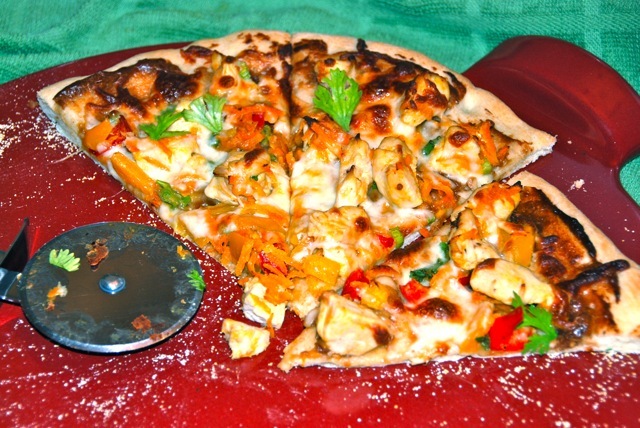 A few years ago, I made this Thai Chicken Pizza for a girls night in Boston. The vegetarian of the group must have been busy that night… or perhaps I left the chicken off that night. In any case, I remembered the pizza being delicious and decided it was high time I made it again. Nick is a big fan of Thai flavors, especially peanut sauces, so I knew this one would be a hit. 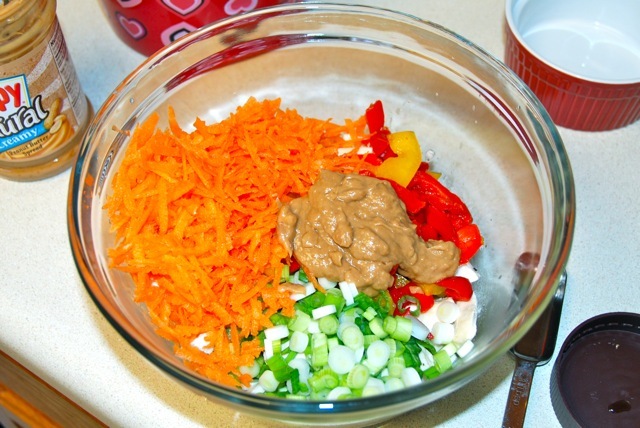 In a small bowl, whisk together peanut butter, water, soy sauce, vinegar, ginger and garlic. Set aside. Heat canola oil in a skillet over medium-high heat. Add chicken and cook, tossing occasionally, until just cooked through. 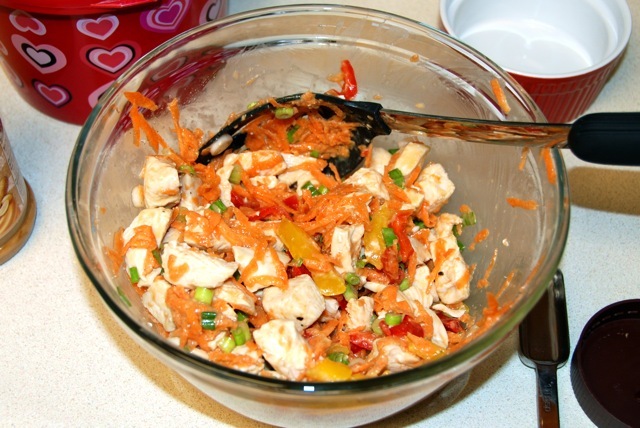 Transfer chicken to a bowl and toss with peppers, scallions, carrots, and about 2 tbsp of the peanut sauce. 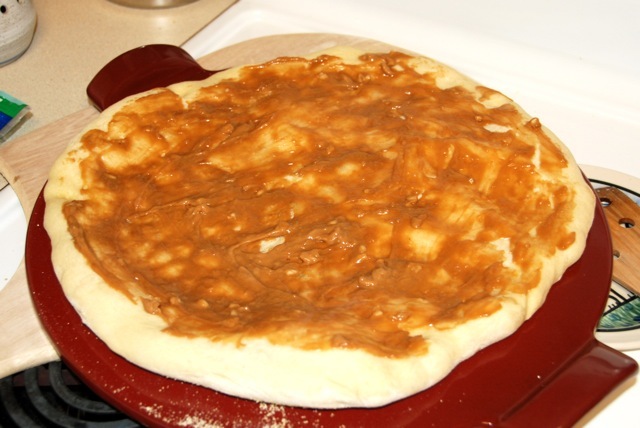 Stretch dough onto 2 pizza pans (or pizza paddle if using pizza stones). Bake the dough about 5 minutes, until just beginning to brown in the thinnest areas (pre-baking the dough a bit will help to prevent toppings from burning). 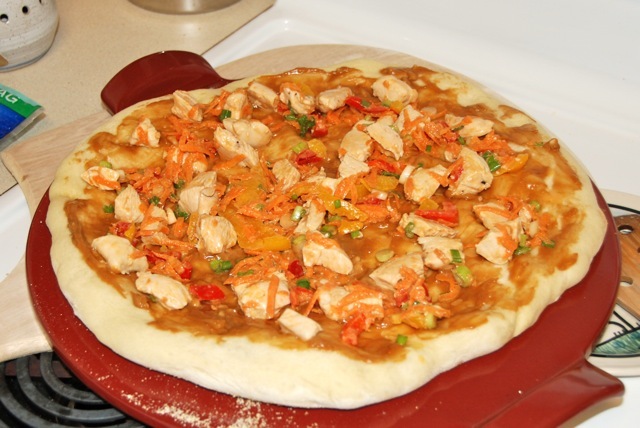 Top each pizza dough with half the peanut sauce. Then top each with half the chicken mixture, and sprinkle each with half the cheese. Return to oven and bake until crust is crispy, about 12-15 minutes. 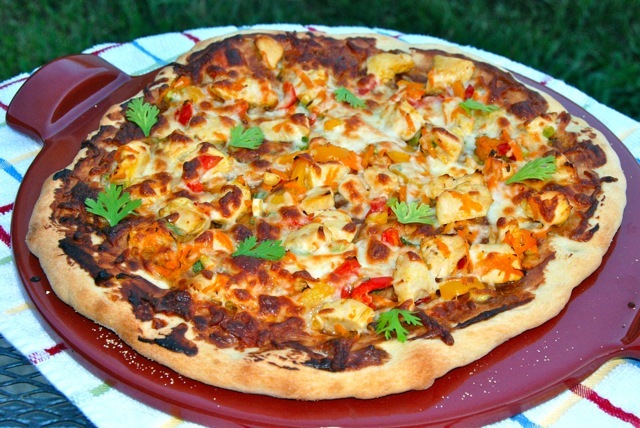 The pizza came out great, and, as expected, was a big hit! Next time I might add something to spice it up a little. I can never get enough spicy food and it seems to me Thai food should be spicy. 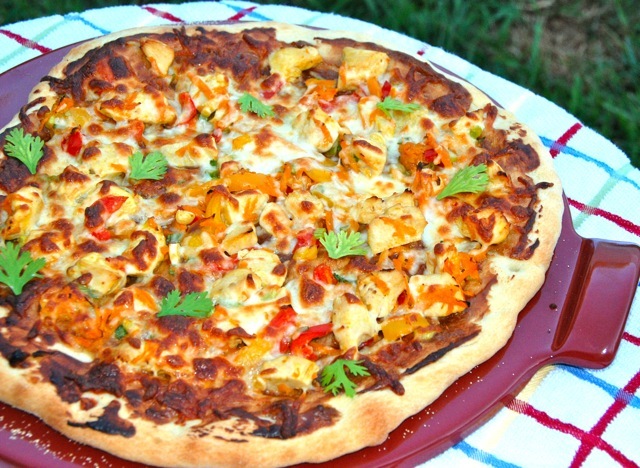 I sprinkled mine with red pepper flakes and we dipped out crusts in Thai chili sauce. That seemed to do the trick! Maybe a sriracha drizzle next time?